Woohoo! Welcome back to Reading Wildly! We had a nice little break over the summer because it is basically impossible for us to get together and meet while summer craziness is going on. Now, the kids are back in school, we are scheduling tons of booktalks, and it's time to pick up with our monthly reader's advisory training. 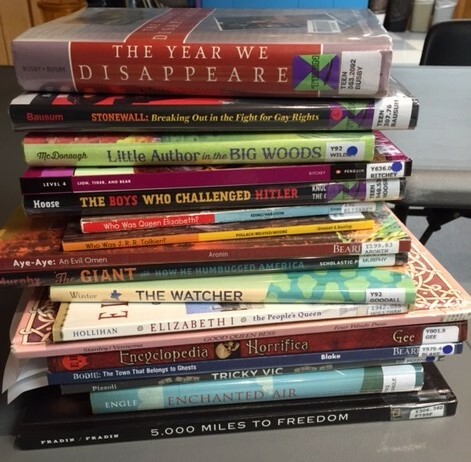 Our topic this month was Nonfiction, and before we started sharing our booktalks, I asked for a show of hands who found themselves regularly reaching for nonfiction when it's not assigned as their RW topic. I had a few who seek out nonfiction (including myself), but the majority of my staff do not feel that they gravitate towards nonfiction. I have found that a lot of people have that disinclination. I don't know if it's just that they expect the books to be dry and boring or if the larger format of children's nonfiction is not as amenable to carrying a book around with you, or something else. But I am here to tell you that if you are avoiding children's and YA nonfiction, you are MISSING OUT BIG TIME!!!!!! We didn't discuss an article this month because SUMMER, but I had selected one, so I passed it out as optional reading: The Dazzling World of Nonfiction by Donalyn Miller (Educational Leadership, November 2013). For our meeting in September, we will be discussing contemporary, realistic fiction and the article One Tough Cookie by Carey E. Hagan (The Horn Book Magazine, September/October 2011).